Victoria, BC, Canada – Reliable Controls is pleased to announce the MACH-ProView™ LCD (MPV-L) controller is officially listed with the BACnet® Testing Laboratories. The MPV-L is the first dual-listed BACnet Building Controller (B-BC) and BACnet Operator Display (B-OD) listed product, following in the steps of the MACH-ProWebCom/Sys™, which was the first dual-listed B-BC and BACnet Operator Workstation (B-OWS) product. The MPV-L is also the first product to receive a BACnet Conformance Certificate for a B-OD device tested to revision 14. 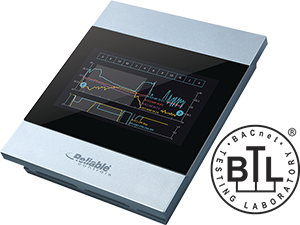 The MPV-L fully integrates with all BACnet products, allowing an elegant interface to your controlled environment. With a selection of configurable views and multiple color themes, the MPV-L fits virtually any décor. The MPV-L controller now ships with the BTL mark and are featured on the BTL Product Listings page of the BACnet International site. BTL was established by BACnet International to support compliance testing and interoperability testing activities. Products must meet the BTL’s mandatory requirements to be eligible for BTL listing.